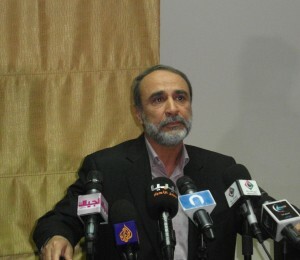 Abdulrahman Swehli (Photo: From archives by Sami Zaptia). Presidency Council head, Faiez Serraj, yesterday condemned in the strongest terms the attack on the motorcade of Abdulrahman Swehli, the head of the High State Council and his delegation in Gharian yesterday. Swehli had been conducting a meeting of the Western/Nefusa mountains city during which he had held a number of meetings with the city’s various leaderships. In his statement yesterday, Serraj said that the attack was an attempt to abort efforts to enshrine security, consensus and national reconciliation. He assured that those responsible for the ‘‘criminal’’ act would be pursued and brought to justice. The attack on the motorcade was carried out by militias as it made its way from Gharian to Yefren. Two Presidential Guard security personnel were slightly injured. Two were arrested and a vehicle was held for further investigation. The trip forced the delegation to abandon their trip and fly back to Tripoli by helicopter.